John’s parents, Henry Martin Tozer and his mother Mary Elizabeth Upton married in St Paul’s Church at Gorsedd in 1882 (C08/1/E58). The 1891 census records that Henry M. Tozer, 37 was a Publican and Coal Dealer who had been born in Cheshire. His wife Mary, 38 had been born in Bagillt, Flintshire. Their listed children were John Tozer, 9, a Scholar who had been born in Whitford, Flintshire, Elizabeth 5, Annie 4, r Lilie, 2 and Mary A.L. Tozer who was 4 months. There was a Boarder Daniel Jones, 33 a Coal Miner and two servants, Peter Jones, 22 a Coal Carter and Maggie Hunt, 22 a Domestic Servant. I cannot find John nor any of the family on the 1901 census. Any help with finding the family on this census would be appreciated. UK, Soldiers Died in the Great War, 1914-1919 accessible on www.ancestry.co.uk confirms John Tozer’s regimental details above and tells us that he enlisted in Shotton, and resided in Queensferry. His medal card, also on ‘Ancestry’ details his medals and tells us that his first Theatre of War was France and he entered it on the 19th July 1915. Less than 10 weeks later he was killed. John Tozer in the UK, Army Registers of Soldiers’ Effects, 1901-1929 tells that the sole Legatee was his father Henry Martin Tozer who was paid £4. 4s 5d on the 17th December 1915 and his War Gratuity of £3. 10s 0d on the 28th July 1919. There is an index card for John in The flintshire Roll of Honour at The County record Office in Hawarden (Card F 24 Queensferry) tells us that he enlisted at the very beginning of the War. Missing – Lance-Corporal J. Tozer, Queensferry. 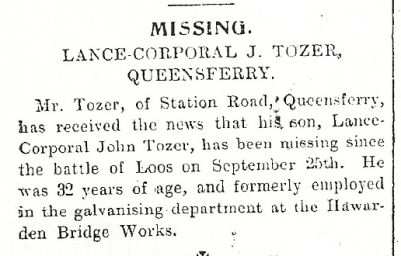 – Mr. Tozer, of Station Road, Queensferry has received the news that his son, Lance-Corporal John Tozer, has been missing since the Battle of Loos on September 25th. He was 32 years of age, and formerly employed in the galvanising department at the Hawarden Bridge Works. Queensferry – Killed in Action. Intimation has been received from the War Office of the death of Lance-Corporal Tozer of the Royal Welsh Fusiliers, who was killed in action on the 25th September last, in France. Lance-Corporal Tozer was the eldest son of Mr. Henry Martin Tozer, of Hawarden View, Queensferry, formerly of Mwdwl Ethin, Carmel, Holywell. He was 32 years of age. The Flintshire Observer 2nd December 1915 confirmed their previous story. Lce-Cpl Tozer – Amongst the list of missing , now reported killed in the action of the 25th September, and issued from the base under date November 10th? (very faded print) appears that of Lance-Corporal J. Tozer, of the 9th Battalion Royal Welch Fusiliers, and the eldest son of Mr. Henry M. Tozer, of Hawarden View, Queensferry, and formerly of Holywell. 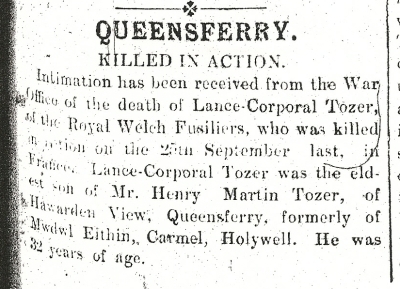 Lance-Corporal Tozer was 32 years of age. John is also remembered on the St. Ethelwolds Church Screen, to the left of the Altar in the Lady Chapel.